Der Blaue Reiter (The Blue Rider) - in quotes. 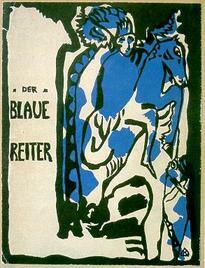 Der Blaue Reiter (Blue Rider) was a group of artists including their Art-Journal, initiated in 1911, in Munich, Germany. The group and the journal was founded by Kandinsky & Franz Marc and played an important role in German Expressionism. Participating artists were Russian emigrants, including Wassily Kandinsky, Alexej von Jawlensky, Marianne von Werefkin, and native German artists, such as Franz Marc, August Macke and Gabriele Münter. design, 1912 by Franz Marc and Wassily Kandinsky, published by R. Piper & Co. It is impossible to explain the latest works of these wild men | that is, the artists of Der Blaue Reiter, and Die Brücke, [working in Munich, and Berlin] in terms of a formal evolution and a reinterpretation of Impressionism. The loveliest prismatic colors and the famous Cubist style have become meaningless in terms of the objectives of the iconoclasts. Their thinking has a different aim: with their labor, they want to create symbols for their era. symbols that belong on the altars of the coming spiritual religions behind which the technical producer will vanish. The editors of the Der Blaue Reiter will now be the starting point for new exhibitions.. .We will try to become the center of the new movement. The association may assume there the role of the new (Scholle). We wish to propagate in this small exhibition not one precise and special form, but we intend in the variety of the forms represented to show how the inner wish of the artists expresses itself. I have just been thinking that Der Blaue Reiter does not really represent my work. I have always been convinced that other things of mine are more important.. .Narcism, fake heroism, and blindness have a lot to answer for, in the Blaue Reiter. All those high-sounding words about the birth of a great spiritual moment still resounding in my ears. Kandinsky can air his personal opinion about that or any other revolution he cares to mention. But I dislike the whole thing.. .Take my advice – work, and don't spent so much time thinking about 'blue' riders or 'blue' horses. [Their] things [works of Die Brücke artists] must be exhibited. But I think it is incorrect to immortalize them in the document [Almanac?] of our modern art (and, this is what our book ought to be) or as a more or less decisive, leading factor. At any rate I am against large reproductions [for prints of Die Brücke works in The Blaue Reiter Almanac]. A great era is beginning and by this time has begun: the spiritual 'awakening,' the emerging inclination to regain 'lost balance,' the inevitable necessity of spiritual cultivation, the unfolding of the first blossoms. We are standing at the threshold of one of the greatest epochs that mankind has ever experienced, the epoch of Great Spirituality. In the nineteenth century just ended, when the flowering — the 'great victory' — of the material seemed most intense, the first 'new' elements of a spiritual atmosphere were formed almost unnoticed. They will give and have given the necessary nourishment for the flourishing of the Spiritual. Our first and most important goal is to reflect artistic events directly connected with this change and the facts needed to shed light on these events, even in other fields of the spiritual life. Therefore, the reader will find works in our series that bear an inner relationship to one another in the aforementioned context, although they may appear unrelated on the surface. We honor and attend, not to the work that has a certain recognized, orthodox, external form (which usually is all there is), but to the work that has an inner life connected with the great change. And that is only natural, since we don't want the dead but the living. Just as the echo of a living voice is only a hollow form, which has not arisen out of a distinct inner necessity.. It should really be unnecessary to emphasize that in our case the principle of internationalism is the only one possible. However, in these times even this must be noted: that an individual nation is only one of the creators of the whole; alone one can never be seen as the whole. Like the personal, the national is automatically reflected in each great work. But in the final analysis this national coloration is of secondary importance. The whole work, called art, knows no borders or nations, only humanity. But we [der Blaue Reiter artists] had no contact with the painters of the Dachau and Worpswede School. It was only much later, for instance, that we discovered that Hoelzel had already been experimenting with non-objective compositions as early as 1908. We were only a group of friends who shared a common passion for painting as a form of self-expression. Each of us was interested in the work of the other members of our group, much as each of us was also interested in the health and happiness of the others. But we were still far from considering ourselves as a group or a school of art.. .I don't think we were ever as programmatic in out theories, as competitive or a self-assertive, as some of the modern schools of Paris. 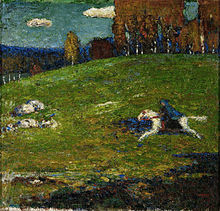 I have now forgotten who was responsible for the original idea [the publication of the art-journal 'Der Blaue Reiter' / 'Blue Rider'], perhaps because I have never been particularly interested in theory.. .The Neue Künstlerverein [in Münich] didn't approve of Wassily Kandinsky's ideas in 1911 and rejected his 'Composition No. 5.' as too big for their show. So Wassily Kandinsky withdrew from the association, and Franz Marc, Kubin, Le Fauconnier and I followed this lead. It was then that Kandinsky began to write the book that became 'Der Blaue Reiter'. I think we were all more interested in being honest than in being modern. That's why there could be such great differences between the styles of the various members of our group.. .They had great faith in each other. I think that each of them knew that the other, as an artist, was absolutely honest. Whenever Kubin came to Munich from his nearby country retreat, they [ Wassily Kandinsky and Kubin] spent many hours together, and I wish I had been able to take down in shorthand some of their conversations. Their ideas about art and life were so different.